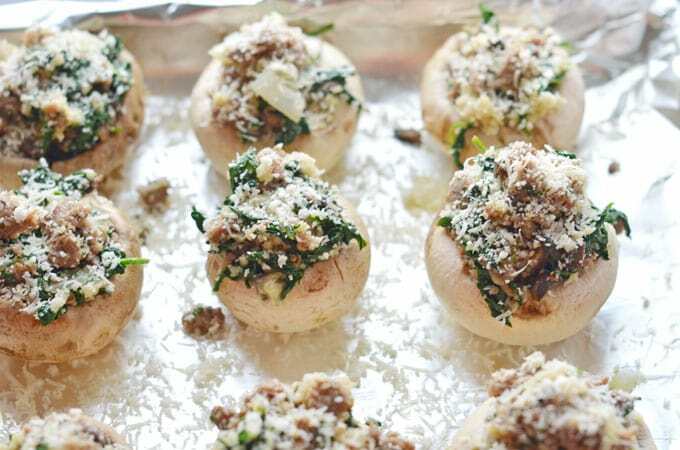 This spinach and sausage stuffed mushrooms recipe combines delicious classic flavors for the perfect party appetizer. There’s just something I love about finger foods and trying out new appetizer recipes. I think part of it is that the dishes are bite-sized, so you don’t need a bunch of utensils and can instead spend your time walking around and socializing with guests. The other part is that when you serve bite-sized foods, you usually have a large variety of dishes so you can pick a number of foods to enjoy. That’s a major bonus for this indecisive girl that always wants to try a bite of everything. There are all sorts of stuffed mushrooms these days. But, when I think of classic stuffed mushrooms I definitely channel cheese, breadcrumbs, garlic, and spinach, or parsley. I can certainly eat enough of these easy stuffed mushrooms to be a meal, so I like to add some sausage, too. The result is a nice rich and creamy stuffing topped with a crispy breadcrumb topping for the perfect bite. What’s The Best Sausage To Use For Stuffed Mushrooms? One of the things the mushrooms get the most flavor from is the sausage, so it’s important to use a sausage you enjoy the flavor of. You can use any sort of sausage whether it’s pork, chicken, or even vegan. I usually pick a pork breakfast or Italian sausage as there’s almost always some in our fridge. In this particular iteration, I used Jimmy Dean’s hot pork breakfast sausage that comes in a roll. What Are The Best Mushrooms To Use For Stuffed Mushrooms? First of all, you want to use whole fresh mushrooms. Canned or frozen mushrooms will be too watery and I’m honestly not sure I’ve ever seen any that weren’t sliced anyway. For the fresh mushrooms, it can depend on the size of the mushroom you want to serve. For standard stuffed mushrooms look for white mushrooms, sometimes called white button mushrooms, or baby bellas or cremini mushrooms. Baby bellas/creminis tend to have a deeper flavor than white mushrooms. For a larger stuffed mushroom, some stores now sell mushrooms specifically sized for stuffed mushrooms. This is what I used for this recipe and they were labeled as gourmet stuffing mushrooms. If you want extra-large stuffed mushrooms, perhaps as an entree, look for portabella mushrooms. Note, not baby bellas which are much smaller. Only the large portabella mushrooms usually need to be pre-cooked. 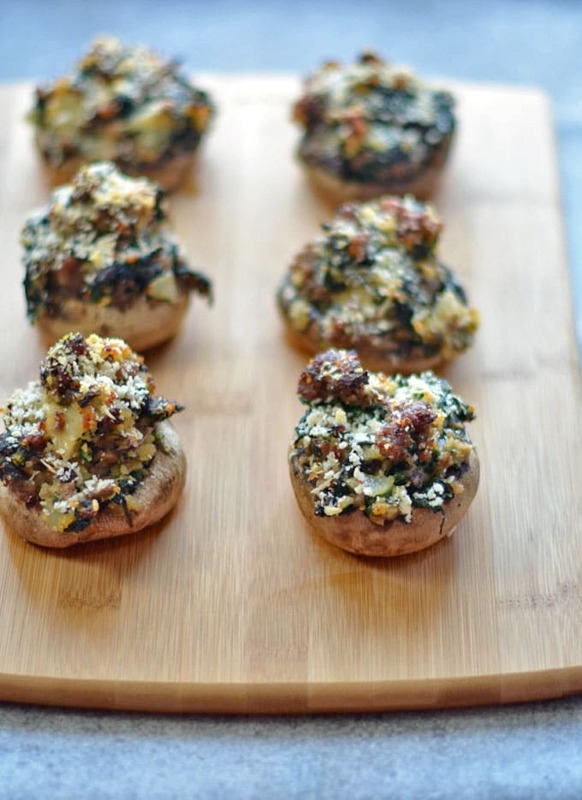 Here’s how to make my favorite stuffed mushroom recipe. 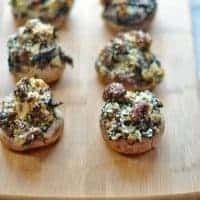 This spinach and sausage stuffed mushrooms recipe is a great appetizer to make year round that everyone will love. Wash mushrooms with a damp cloth to remove all dirt and debris. Remove stems from mushrooms and then finely chop the stems to use in the stuffing mixture. If you run across any stem sections that are dry or woody, discard them those sections. Place mushroom caps on a baking sheet (line with foil for super easy cleanup) and preheat oven to 400°F. In a medium to large skillet, brown sausage, breaking it into small bite-sized chunks as it cooks. Remove sausage from skillet once cooked through and place on a paper towel lined plate to absorb excess grease. In remaining sausage fat (if you don't have at least a tablespoon or 2, you can add in some olive oil or butter), sautee chopped mushroom stems, onion and spinach until soft. Once they start softening, add the garlic. You don't want to add it too early because garlic can easily burn and become bitter. Once everything has cooked (use a slotted spoon so you don't have too much extra fat or moisture) move the veggie mix and sausage into a medium-sized bowl - I just use the one I put the initial chopped veggies in. Add 3/4 cup of the breadcrumbs and 1/4 cup of the grated cheese to the mixture and stir to thoroughly combine. Salt and pepper to taste. I also like to salt and pepper the mushrooms a bit, especially the large ones, before stuffing. Using a spoon or small cookie scoop (which is great so you can get a lot of stuffing on the caps without it falling everywhere), scoop the stuffing mixture onto the caps. Evenly sprinkle remaining cheese and breadcrumbs over stuffed mushrooms. If you would like to make sure the cheese and breadcrumbs get nicely browned, you can drizzle the mushrooms with just a bit of melted butter or olive oil. Bake in 400°F oven for 15 - 30 minutes depending on size of mushroom, until stuffing has browned on top and mushrooms are soft and tender. Transfer mushrooms to serving plate and serve warm. Store leftovers in refrigerator - they will keep for 1 - 2 days and can be reheated in the oven without being soggy. If you really like it spicy, you can add in some red pepper flakes, cayenne, or sriracha sauce as well. Nutrition information may not be accurate. Exact nutrition information depends on the specific ingredients and brands you use. Very nice recipes I want to make stuffed mushrooms for our Christmas and the Berry Spritzer, I’m having one tonight!! I like all the ingredients in this appetizer. Can I just make a bunch and have it for dinner? I’m not a big fan of mushrooms but most people I know love them. This would ne a good snack to serve at a party. I want to make this recipe, and follow it to the “T”! It sounds and looks so perfect! 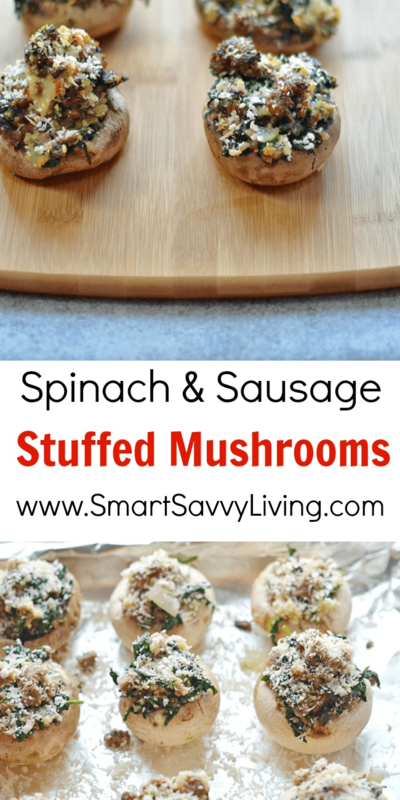 I haven’t had a stuffed anything that could compare to this, and I love mushrooms, sausage and spinach! Any finger food is a good recipe for casual get togethers, and serving this piping hot will make everyone so happy! This looks so healthy and yummy. And the presentation is also exciting to look at the kids will surely get lured to taste it. Thanks Jeremy, I think kids would also enjoy them!